Conservative treatment includes regular rest in elevated position combined with gentle exercise, elastic stockings to support the weakened veins. Radiofrequency vein ablation is minimally invasive interventional procedure that uses radiofrequency or laser to seal off varicose veins. Using ultrasound guidance a thin catheter is inserted through the skin into the vein (great saphenous vein). When properly positioned, radiofrequency or laser energy is applied, heating up the vein and closing it off. 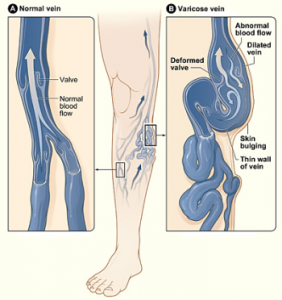 Once the varicose vein is closed, other healthy veins will take over the function of that vein and establish normal blood flow.